Tommy is one of the world’s leading Sports Entertainers. He has pioneered a new concept inspired from old circus juggling acts and the latest fashions in sport. 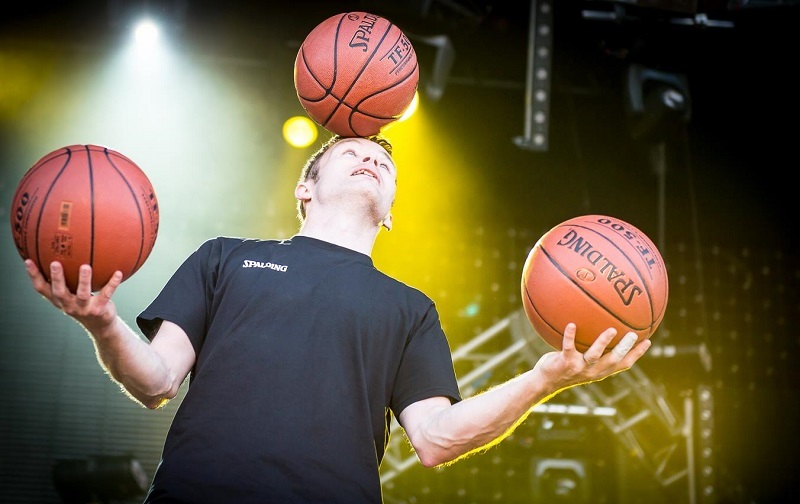 During Tommy’s live act you will see him juggle, spin, dribble and body roll 3 regulation size basketballs as well as other 1 and 2 ball trickery.In addition, Tommy is a highly skilled football juggler – juggling, spinning and rolling 1, 2 and 3 footballs! This is a rather different act using both head and hands, juggling, spinning and rolling 1, 2 and 3 footballs. This great mix and mingle act does not require a stage or background music and focuses on entertaining and transferring football skills to participants. This act is ideal for venues with moving or passing crowds. Tommy found his passion for basketball tricks in childhood and has been practicing ever since. He continues to dedicate 30 hours a week to his craft with no end in sight. His life long dedication means that he is ready and energized to perform at any time. The unique nature of his material makes him an original and sets him apart from other sport related entertainment. Tommy performs locally and internationally for corporate events, product launches, store promotions, halftime shows, festivals, parties and TV commercials. His skills create an instant impact and focal point at any suitable event. His recent appearances include; NBA All-Star Weekend 2008, back-to-back winner of Nike Streetgodz competition 2007-08, Extreme Sports TV Streetball tour and a Harlem Globetrotters halftime show. Tommy’s live performances continue to push the limits as he lifts the ‘new’ craft of basketball freestyle to almost unreachable standards. Riding on the great success of last year’s NBA event, Tommy was invited to perform once again at the NBA Jam Session 2009, this year based at the Convention Centre, Phoenix, Arizona. The Jam Session visits a different US city each year for the main NBA All-Star Weekend event, when the top professional basketball players in the USA play exhibition games broadcast on TV worldwide. As part of the entertainment for the visiting fans the NBA Jam Session hosts a Guinness World Records event, with gifted individuals like Tommy selected to set new world records and attempt to break existing ones. 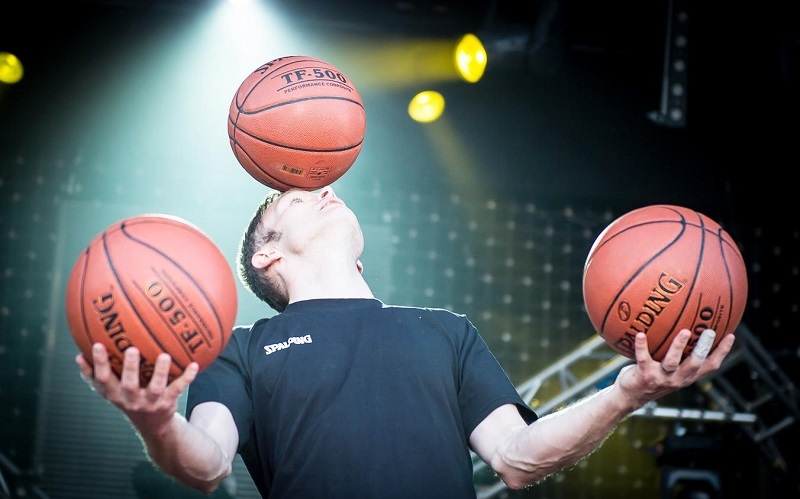 The longest time spinning one basketball on top of another using one hand only – 32.88 seconds and the most arm and head rolls combined using three basketballs – 10 in a row. 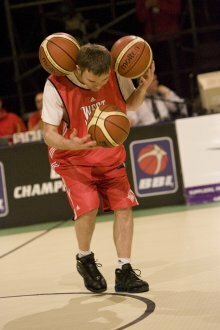 The most headers with a basketball whilst spinning two other basketballs on his fingers a total of 40 headers. All three records were authenticated by Stuart E. F. Claxton – US Business Development Manager for Guinness World Records, New York office. Further to these world records in February 2009, Tommy’s latest attempt to better this final record was filmed on April 9, 2009 at Pinewood Studios for the new ‘Guinness World Records Smashed’ 11 part TV series. 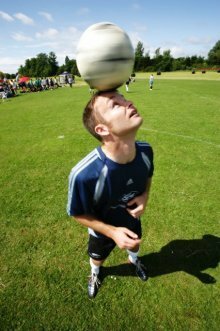 Tommy is also featured in three earlier editions of the ‘Guinness World Book of Records’ for the longest time spinning a football on his forehead. This world record is no longer current for Tommy. Standard Length of Perfomance: For mix and mingle – up to 2.5 hours with breaks. Stage show – 5 minutes. Tommy the basketball trickster was really good too, the kids really liked him and he encouraged them to do some tricks too.